Do you enjoy helping people make airline and hotel reservations and have past experience booking international travel? If so you may want to think about applying to Carlson-Wagonlit Travel. 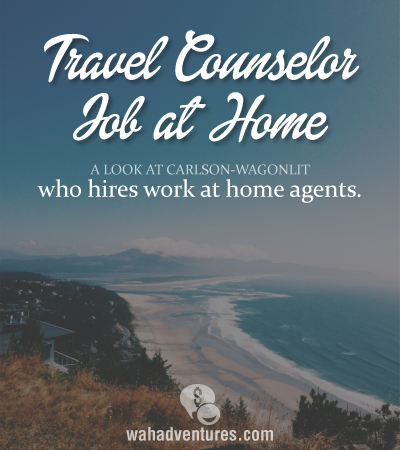 This article will provide more information on working from home as a travel counselor with Carlson Wagonlit Travel, including the skills you need, what you’ll do as a travel counselor, and the benefits you’ll receive. There have been other work at home travel based jobs with other companies reviewed on WAHAdventures as well, be sure check those out too. What do travel counselors do at Carlson-Wagonlit travel? Travel counselors are responsible for booking hotels and helping people reschedule travel. What kind of skills and experience do I need to have? Skills and experience needed include prior international reservation experience, fluent in Microsoft Word, Excel, PowerPoint and Outlook, experience in using Sabre Airline Solutions and network, attention to detail, pleasant telephone manner, and good written and verbal communication skills. What kind of benefits does Carlson-Wagonlit Travel offer their employees? Carlson-Wagonlit Travel employees receive several benefits. They include life, accident and disability insurance, emergency travel assistance, health, medical and dental coverage, maternity and parental leave, access to health and wellness clinics and webinars, the Registered Retirement Savings program matching program, and the Life Balance employee assistance program. In addition, employees receive several travel perks. These include the Family and Friends vacation club, where CWT employees and their families can book travel at a reduced rate. In addition, family and friends of CWT employees can receive discounts through their preferred leisure suppliers for all packages. They receive a 2% discount on all holidays with a base price of under $1,000, and a 4% discount on holidays with a base price of over $1,000. How much would I make per hour? Travel counselors at Carlson-Wagonlit Travel make $15 per hour. How many hours would I work per week? You would work 40 hours per week during business hours. Can I work part-time at Carlson-Wagonlit Travel? Yes, part-time positions are available – they would have to be discussed with the hiring manager. The hiring process starts with filling out an online application. Then you’ll go through some assessments and have your first interview with a recruiter, as well as interviews with several stakeholders and/or managers at Carlson-Wagonlit Travel, followed by a background and reference check. If you get through all those steps successfully, you’ll be offered a position and will start preparing for onboarding and training. Please note that this job is location specific – when you’re doing your search, choose “yes” in the work at home box, and then check to see if they’re hiring in your location. Hi, I would like to be a travel phone counselor agent. Do the work from home.